Pistorius Falls To Britain's Peacock In 100 Meters; American Browne Is Second : The Two-Way South African Oscar Pistorius failed in his attempt to win the 100-meter sprint and regain his title as the world's fastest amputee, losing to Great Britain's Jonnie Peacock. American Richard Browne, 21, of Jackson, Miss., won the silver medal. Bronze medalist Arnu Fourie of South Africa (from left), gold medalist Jonnie Peacock of Great Britain, silver medalist Richard Browne of the United States and Oscar Pistorius of South Africa cross the line in the Men's 100m - T44 Final at London's Olympic Stadium. In one of the most closely watched events at the London Paralympics, South African Oscar Pistorius failed in his attempt to win the 100-meter sprint and regain his title as the world's fastest amputee today. 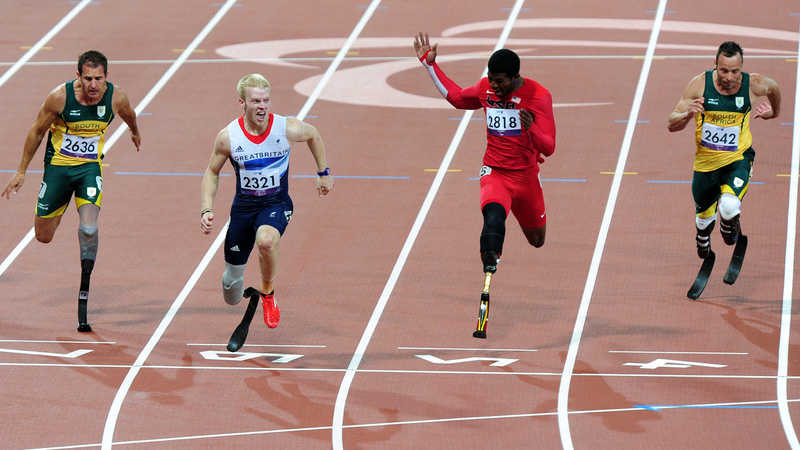 Great Britain's Jonnie Peacock took the lead early and kept it, winning in 10.90 seconds, a Paralympic record. American Richard Browne, 21, of Jackson, Miss., won the silver medal. Pistorius, the double amputee who ran in the Olympics this year, came in fourth. He finished in 11.17 seconds. Peacock, a single amputee, is just 19; he calls Pistorius his hero. After the race ended, Pistorius was quick to congratulate Peacock. Single and double amputees race against each other in world competitions. Pistorius became the world's best-known disabled athlete during his fight to be ruled eligible for the Olympics, running on his two prosthetic blades. Along the way, Pistorius, who once dominated the sprint in the Paralympics, has attracted more athletes, and better competition, to the games. Among the new arrivals is Peacock, who set the world record for a single amputee at the Paralympic trials in July. Alan Fonteles Cardoso Oliveira of Brazil, who upset Pistorius in the 200-meter final Sunday, finished last in the 100 meters. The long blades that led Pistorius to complain about an unfair advantage after that loss gave the Brazilian problems today, as he had trouble keeping his balance on them and fell, creating a false start. Earlier this year, American Blake Leeper tied Pistorius's world record for a double amputee, but he came in fifth Thursday. Another American, single-amputee Jerome Singleton, had been the first runner to beat Pistorius in seven years, when he won the sprint at the world championships in 2011. Singleton finished in sixth place.